Somewhere at this very moment on Planet Earth, the Antichrist is almost certainly alive—biding his time, awaiting his cue. Banal sensationalism? Far from it! That likelihood is based upon a sober evaluation of current events in relation to Bible prophecy. Already a mature man, the Antichrist is perhaps active in politics and might even be an admired world leader. Or he could be the head of a multinational corporation, a little-known international banker of great wealth and behind-the-scenes influence, a sports hero—or he might arise suddenly from total anonymity. Somewhere he is being meticulously groomed, though as yet he probably has no more inkling than do those who encounter him daily of the ultimate role for which Satan is preparing him and will, one momentous day, utterly possess him. Whoever and wherever he is, one passion rules this remarkable man—a lust for power. Even so, benevolence, prudence, integrity, and principle mark his circumspect public behavior. It may be that at this point in his life he is still convinced that his motives are altogether pure and unselfish. Antichrist! The media has so conditioned our minds that the very word instantly conjures up the image of a sinister man who exudes evil from every pore. But Hollywood caricatures play into the hands of the real Antichrist, since no suspicion will rest upon this one whose admirable qualities so well conceal his dark designs. When the time has come for his surprising world takeover, precipitated by an unprecedented global crisis, he will be hailed as the world’s savior—and so he will appear to be. The Apostle Paul dispels popular misconceptions and gives us the awesome facts: “Satan himself is transformed into an angel of light. Therefore it is no great thing if his ministers also be transformed as the ministers of righteousness...” (2 Corinthians:11:14,15). We may be certain that Antichrist will appear as the purest “angel of light” that Satan can produce. Society has been undergoing a step-by-step preparation for the advent of Satan’s messiah, and in our moment of history has at last produced a generation so perverted that it will actually mistake the Antichrist for Christ. In the name of freedom and right of choice, our most blessed of nations has condemned its unborn to the cruelest of deaths, has made a mockery of the sanctity of marriage, entertains itself with films and music centered on themes of violence, Satanism, and sexual perversions, has all but destroyed millions of its youth with drugs, and has created an urban war zone and a poisoned planet. Evil will soon be ripe for harvest. Jesus warned that many would come claiming to be the Christ. These numerous lesser antichrists who were already in the world, as the Apostle John explained in 1 John:2:18, would prepare the way for the real Antichrist who would appear in the last of the “last days.” Behold the ultimate deception: Satan posing as God, Antichrist masquerading as the true Christ, and not just the world but an apostate church as well totally taken in by the bold fraud. Instead of a frontal assault on Christianity, the evil one will pervert the church from within by posing as its founder. He will cunningly misrepresent Christ while pretending to be Christ. And by that process of substitution, he will undermine and pervert all that Christ truly is. Anything less than such a diabolically malevolent strategy would be unworthy of Satan’s foul genius. This is an altogether different scenario from that envisioned by most people. If they believe in a literal Antichrist at all, they presume he will be an obviously evil ogre whom any child would immediately recognize. In fact, however, he will be the closest counterfeit of Christ that Satan can produce. Completely deceived by this brazen masquerade, the world will hail him as its deliverer. And right there is where the plot thickens. If the Antichrist will indeed pretend to be the Christ, then his followers must be “Christians”! The church of that day will, with scarcely a dissenting voice, hail him as its leader. Such perversion and deception are beyond the ability of the imagination to conceive. It is certainly not what the average person has been led to believe. Yet this is the picture which the Bible presents and to which current events ever more clearly seem to point. It becomes immediately apparent that such an unthinkable scenario requires certain preconditions to make it credible. First of all, the apostate church in the last days must become so corrupted that it actually opposes what Christ taught while at the same time insisting that it is faithful to Him. Satan’s lie will be honored as God’s truth—without the church leaders who deceive, and those who are deceived, even knowing that such a metamorphosis has taken place. Moreover, the preparation for the great delusion must have been well in process from within the “last days” church itself even before the Antichrist appears. Jesus himself, who raised the question whether there would be any faith whatsoever on the earth when He returned (Luke:18:8), used language similar to Paul’s. When His disciples asked Him what would characterize the last days just prior to His return, Jesus explained that it would be a time of the greatest religious deception the world had seen to that point, or would ever see again. He prefaced His remarks with this solemn warning: “Take heed that no man deceive you ” (Matthew:24:4; cf. 5,11,24). Those who truly know the Lord and heed such warnings will not succumb to the spirit of the last days. Like God, who weeps over a rebellious world and delays His judgment to give men time to repent, they will have a passion to bring His truth to the world. Everyone who loves God more than this world, and to whom His evaluation of one’s life means more than the fickle opinions of men, will be kept from the delusion that will sweep the world. Those who fear God and keep His Word have no fear of what others may think or say or do to them, because they fear God with deep reverence. The world must be prepared both religiously and politically to embrace the Antichrist when he suddenly rises to power. If “Christianity” is to be the official world religion (which must be the case if the Antichrist claims to be Christ returned), then it must become broad enough to accommodate all of the world’s faiths. As for the political climate, the world must be united in the twin causes of global peace and ecological rescue when this man appears. There are only two persons who will hold absolute rule over this world. The first is the Antichrist and the second is the Lord Jesus Christ. Every person must choose between these two antagonists and their opposing kingdoms. There is no neutral ground. ). Paul makes very clear what this means: That only when Christians have received their immortal bodies and are glorified with Christ (verses 23-25), ruling and reigning upon this earth with Him, will earth be delivered from its turmoil and pain. Evangelicals tend to present the gospel exclusively as a remedy for personal sin and the procurement of an eternal home in heaven. They generally neglect to proclaim it as God’s means of bringing peace to this troubled planet, as did the angels at the birth of Christ and as did the early church. It is the duty of every Christian political leader, whether president, ambassador, or other official, to make very clear to the entire world that all human efforts to achieve peace are in vain unless Jesus Christ is invited back to this earth to reign in individual hearts and over all nations.
) to the outpouring of the Spirit at that time upon the disciples. However, carefully reading the context in Joel, along with Peter’s words, makes it clear that Peter was not declaring that what was happening at that moment was the fulfillment of Joel’s promise. Rather, it was a sample of what could have occurred if Israel had repented of her rejection of Christ: She could have experienced the millennial reign of her Messiah, which Joel went on to describe. It was an offer that Israel refused (as it had been prophesied she would) but one that she will accept at a future time, after God’s judgment has been fully visited upon her. The Apostle John, writing in about ad 95, declared: “Little children, it is the last time: and as ye have heard that antichrist shall come, even now are there many antichrists; whereby we know that it is the last time” (1 John:2:18). Yet John was by no means asserting that the “last days” had fully come, as some claim. He made it clear that although there were already many antichrists, the Antichrist was to appear at a future time. Let us be reminded that the Rapture could have occurred at any moment. Indeed, then as now, the early church watched and waited in eager anticipation of being taken to heaven in that glorious event. There are no explicit signs to indicate that the Rapture is about to occur. The “last-days signs” are not for the church but for an unbelieving Israel; not for the Rapture but for the Second Coming. Nothing stands between the church and that “blessed hope” (Titus:2:13) of being caught up to meet her Bridegroom in the air. Those events that Christ prophesied when He was asked for signs of His coming are intended to warn Israel of Antichrist’s appearance and that after guaranteeing her peace he will seek to destroy her. Those specific signs also herald the coming of Israel’s Messiah to rescue her from Antichrist’s attacking armies, an event that Christians refer to as Christ’s Second Coming in power and glory. Since the Rapture comes first, however, certain signs that indicate the nearness of the Second Coming may cast their shadows far enough in advance to tell the church that the Rapture must be soon. Nevertheless, we are always, regardless of any signs, to expect the Rapture to occur at any moment and to live in that expectancy (Matthew:24:44; Luke:12:35,36; Philippians 3:20; 1 Thessalonians:1:9,10; Titus:2:13; Hebrews:9:28; 1 John:3:3; Revelation:22:17,20). As for the Second Coming, it would have been premature for Israel to expect it when only a few of the signs were yet in evidence. Jesus declared: “When ye shall see all these things, know that it [the Second Coming] is near, even at the doors” (Matthew:24:33). Israel has been alerted so that she might know exactly when the moment of her Messiah’s intervention to save her has come. How many of these signs will cast their shadows before them at the time of the Rapture, no one can say. We do know, however, that our generation is the first for whichany of these shadows have appeared, and we now have many . The New Testament writers seem to have understood the “last days” as a time that began with the ascension of Christ and would culminate with His second coming. That event would be preceded by specific signs indicating that the generation that would exist on earth at that time would be living in the last of the “last days.” It is exciting to note that no generation has ever had solid biblical reason for believing that it was living in the last of the last days preceding the second coming of Christ— no generation until ours . 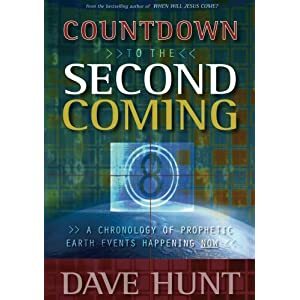 Excerpted from Dave Hunt's book Countdown to the Second Coming. Question: My father abused my siblings and me...for years....How do I honor this man...who has shown no evidence of repentance at all...and when I am no longer his child, by his own vow? How do I address him as “father” or “dad” ever again? Question: Some Seventh day Adventist friends have what they call “The Clear Word Bible.” Something doesn’t sound quite right, and it looks like verses have been changed to support their teachings.